Find a knowledgeable and dependable legal counsel that will assist you in legal advice and the necessary filings for a divorce. If collaboration isn’t going to work make sure you hire an attorney that knows the value of settling quickly and is willing to fight for you if they need to. Make sure you have your financial documents in order before your first appointment with your attorney. You’ll need to complete a financial affidavit. The Petition for Dissolution of Marriage is the first document to file with the court clerk to start the divorce case. Discovery, custody evaluation, pretrial conference or mediation, trial, the decree of dissolution. Make equitable distribution of marital assets and debts, with the goal of fair distribution. Determine pre-marital assets. Move forward to current assets. Obtain appraisals by qualified third party if needed. Know the two forms of debt: living expenses and community property, and how your state distributes the debts. Initially, check the difference of tax rates, lost deduction and tax credits of filing separately verses jointly. Take advantage of any tax savings. Be aware of two important tax dates: the date the divorce petition was filed and December 31 of each year. In Florida, “the marital home” is the piece of real estate property where your and your spouse spent most of your life together. In terms of cash flow and taxes these two terms couldn’t be more different. Consider completing this negotiation prior to signing the martial settlement. We believe that knowledge is power. We understand the importance of educating you so you’ll understand the entire financial process involved with a divorce. Download for FREE our eBook: Divorce. 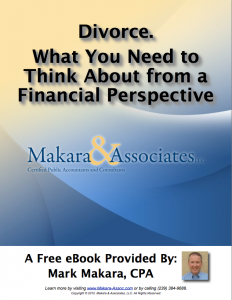 What You Need to Think About From a Financial Perspective from our online library. 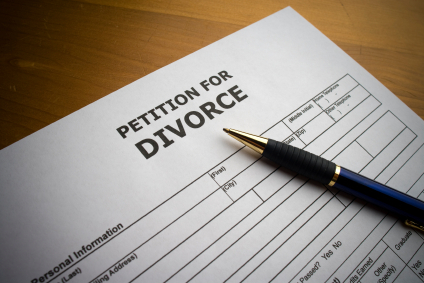 You will come away with a few tips to help you through the divorce process. If you need additional help from a CPA to assist you in sorting through your documents and divvying up your debt, let our professionals assist you with the financial issues that arise. Contact us online, or call us today at our Naples office (239) 384-9688 or Fort Myers office (239) 768-5008. Keep up on our latest information, join us on Facebook.